People with intellectual disability, until recently, had notably earlier mortality rates than the general population, but many are now living into their fifties, sixties and beyond. Many older people with intellectual disabilities lose the ability to perform activities of daily living, which is termed ‘mobility decline’, and this has implications for service planners and intellectual disability nurses (RNIDs), who must provide appropriately designed services, and ensure they are equipped to meet the needs of this ageing population. 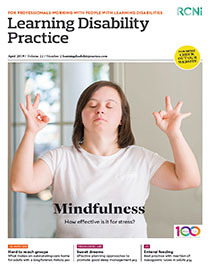 This article highlights the importance of the role of RNIDs in assessing mobility, as part of the holistic assessment of older adults with intellectual disability, and describes a variety of resources practitioners can use.